Danielle Kurtzleben at U.S. News & World Report  crunched some numbers of federal campaign contributions and discovered that the NPR Board and the board of the NPR Foundation are - surprise, surprise - much more likely to donate to Democrats. 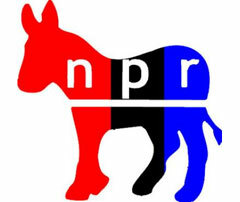 A review of campaign finance data found that NPR board members' campaign contributions have sharply favored Democrats . Since 2004, members of the boards of NPR and the NPR Foundation, the public broadcaster's fundraising arm, have contributed nearly $2.2 million to federal candidates, parties, and PACs, of which $1.95 million, or 89 percent, has gone to Democratic candidates and liberal-leaning political action committees. Officers and trustees of the NPR Foundation, which has no control over the organization's programming, have given substantially to national political campaigns in recent years. According to data from the Center for Responsive Politics, this group's members (as listed on NPR's most recent available annual report, from fiscal year 2008) have given almost $2.1 million to political campaigns in the last eight years. Fully 89 percent of this giving was to Democrats and progressive organizations. These figures include all federal contributions since the 2004 election cycle, the first in which "soft money" contributions were banned. "Soft money" refers to money given to a party for non-campaign activities, which until being banned in 2002 were unlimited and largely unregulated. A majority of contributions from members of NPR's Board of Directors have likewise gone to Democrats. This board comprises 10 NPR station managers, the NPR president, the NPR Foundation president, and five prominent members of the public, selected by the board and confirmed by member stations. Political contributions by these station managers have been virtually nonexistent, and there are also no recorded political contributions from either Ron Schiller or Vivian Schiller. Of the five public board members, however, giving has been far more Democratic than Republican , with nearly 95 percent of the group's $106,000 in contributions going to Democrats or progressive committees. Three of these members have given exclusively to Democrats since the start of 2003, though in amounts less than $5,000 each. One member, Carol Cartwright, has given $4,100 to Republicans and $700 to Democrats. But the biggest giver, John A. Herrmann, Jr., has given $82,500 to candidates and committees since 2003, 98 percent of it to Democrats. Kurtzleben concludes that since the actual board of the Corporation of Public Broadcasting was mostly appointed by President Bush, their "cumulative giving since 2003 totals over $100,000, nearly three-quarters of which has gone to Republicans." - Tim Graham is the Director of Media Analysis at the Media Research Center. You can follow him on Twitter here .